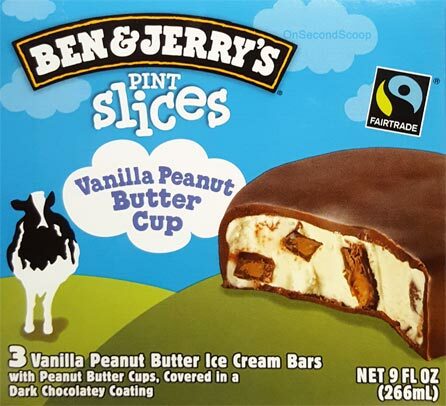 Fresh from the freezer aisle of Walmart (and scoop shops and other grocery stores), there are now four varieties of pint slices you can dig in to. The one above plus Americone Dream, Chocolate Chip Cookie Dough, and Chocolate Fudge Brownie. They are three ounces a piece, come three in a box, and cost me the same price as a regular pint of B&J's (so $4.28 today). I will hopefully go back for the other varieties this weekend, but for the moment I will just be picking up the nut based one to take to work. Nice! I do adore colorful packaging on my treats. I expected it to look a little bigger for whatever reason. The quick version of my review is that I made short work of this treat. My favorite part is easily the peanut butter cups. 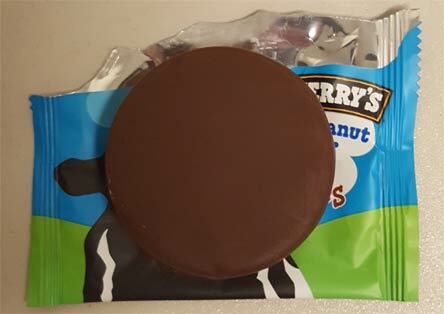 The thickness of the chocolate shell and the quality (density) of the ice cream inside are a nice matchup, but then you run into the mini pb cups and just get this really nice chew in the middle of your snack time. That texture pop just clicked wonderfully to me. The overall flavor profile is good too. I want to say that there is a little of that all natural somethin' somethin' to one of the components, but it's just playing in the background, nothing serious. Remember that I'm not the biggest fan of their regular peanut butter cup ice cream. These aren't salty, gritty Reese cups, these are all natural cups, so just keep that in mind. It's a minor point, very minor, I still really enjoyed this first encounter. That's all I got for the first sampling, but I did enjoy it and am looking forward to the other three flavors. Everything was in balance, it felt like a quality treat, and I'm calling these a winner. 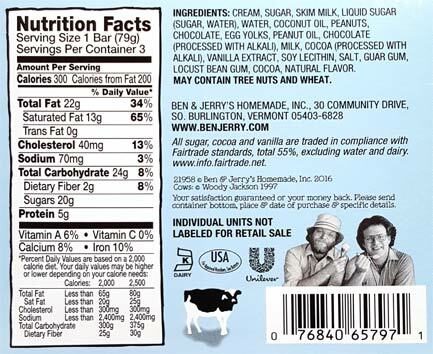 The only real downside here is the fat content, but it's the same as you would find on a Magnum bar. Just don't eat all three at once. 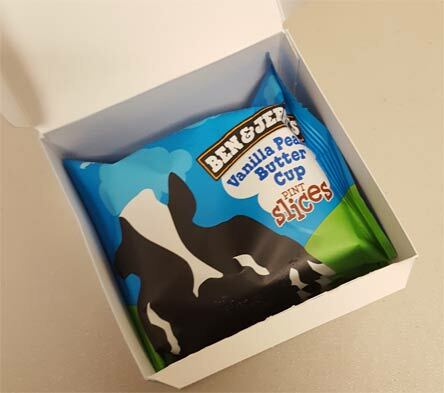 On Second Scoop: Sorry, I devoured the other two and forgot to post my thoughts.... which I have forgotten... no wait, I remember now because I mentioned it on the Nosh Show because someone brought it up in the comments. With Magnum, the treat is about the chocolate first. With these, I feel like the ice cream and particular the mix-ins are the main selling point. 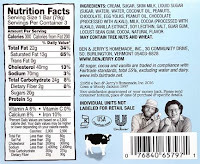 The thing we know Ben & Jerry's for (the mix-ins), in a convenient on the go package. Would you say that they are as good as Magnum Bars? Which would you prefer? I'm curious to see if any new Magnum Bar flavors come out this year (they already have in England). Also, I wonder if Talenti will have new flavors. I would say that Magnum is more focused on an abundance of chocolate, so it would just depend on what I am in the mood for. Nowadays you dont have a choice but to come out with new products every year to help stay relevant, especially on social media. New stuff will be here soon enough. Talenti has new flavors!! Vanilla Chai, Peach Butter Biscuit, Peanut Butter Fudge, and some kind of berry crumble? Or something like that. I'm in NYC, and found them at Stop & Shop. Having the vanilla chai right now - it's very mild, but delicious!